Introducing 4 unique and Random Modifiers including Popping Wilds, Mega Spinata, Grande Reels and Fiesta Frenzy, Pinata Fiesta is a hot and spicy Mexican-themed video slot machine produced by iSoftBet. 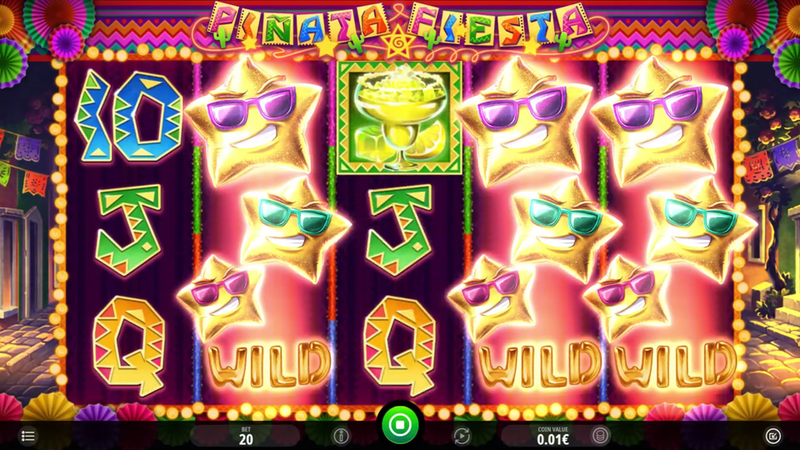 Built on the base with 5 reels, 3 rows, and 20 fixed paylines, the game also puts much trust in Wilds, Scatters and re-triggerable Free Spins, of which you can find all the important details in the Pinata Fiesta slot review. Want to see how Pinata Fiesta works? Select a recommended casino site from the list below and start playing for free or real – our screenshots will give you a sneak peek! Once a pinata starts swirling from the leftmost, it will be a clear sign your game is about to begin. Surely, you have to say will you play for fun or for real money, just like in all other games of this kind. At any random occasion throughout the main course, players may receive a Pinata Fiesta Bonus booster as closely elaborated below. This also works in the Pinata Fiesta Free Play mode with the only difference that you’ll get paid in demo credits. Still, this is more than a good way to learn how to win and pay nothing in front. Along with themed icons, the paytable awarded some extra space to stylized playing cards from Tens to Aces. Arguably, their payout rating is slightly lower, meaning you’ll earn more by lining up 3+ Cocktails and Pinatas of all sorts and shapes. To improve the payline or substitute any other icon but the Scatter, players can use Wilds. This icon has a dual nature and thanks to the Popping Wilds feature, you can get 1 to 10 Wilds spread all around the base game. Just watch balloons popping and hope that all of them will bring some Wilds to help you form more winning combinations. Activate Grande Reels and turn 1 to 3 reels jam-packed with Wilds and thus improve your winning odds, while Mega Spinata turns any random symbol into a 3x3 icon that brings guaranteed winnings. Finally, Fiesta Frenzy makes a cluster of symbols of the same kind. Once exploded, they can surely improve your bankroll and even trigger the Pinata Fiesta Big Win. Even though all 20 paylines are fixed, there’s still enough betting opportunities. The coin value ranges from €0.01 to €1, so you can wager between €0.20 and €20 per round, according to your specific strategy. When 3 Scatters appear anywhere on the reels, you will receive an initial batch of 10 Pinata Fiesta Free Spins. Throughout this round, your chances to activate any of the above-mentioned bonus features are much higher. Moreover, after the round ends, you’ll get to pick 1 out of 3 Pinatas and hopefully extend the gameplay to another 4 spins without having to pay a dime. 3. What is the RTP factor of Pinata Fiesta? The Pinata Fiesta recension will be updated with the official RTP info the same moment the publisher discloses this figure. Colorful and happy, this is a game recommended to the widest audience. Newbies are welcomed to take the Pinata Fiesta tips and try improving their winning odds even though we suppose this will be an easygoing title.